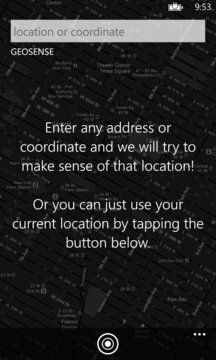 Geosense helps you to make sense of your location! 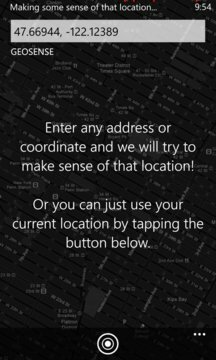 Just enter an address or coordinate, and Geosense will provide information regarding the requested location; or just press a single button and Geosense will get your current location and show you some details about where you are! From the results screen you have the ability to open Bing maps for the specified location, or even copy the details or send them by sms and e-mail message. This application can also be used to convert between Decimal Degrees, MinDec, and DMS coordinate formats.